The peninsula of Coromandel, located in North Island is a must-see stop in New Zealand; famous for its forests, its immense and deserted beaches, and its wonderful and unique views and landscapes. This, and much more, you can discover. The first stop on the Coromandel Range itinerary is a visit to Thames; is the historic New Zealand town located between the "Firth of Thames" and Coromandel Range. In this area, the Maori population settled in the fifteenth century, and only in the 1867, the town has had its current physiognomy. Thames it is the ideal starting point if you want to discover the splendid Coromandel Range. Un beautiful landscape, just as its coastal walkway that you can discover walking or cycling. And the culinary offer, with fresh fish that is served a bit 'everywhere (the seafood, it seems, are the main course) is absolutely top notch. Just behind the city, on the hills, lies the marvelous valley Kauaeranga with its fascinating paths and some of the most adventurous activities and excursions that the peninsula can offer; in this area, moreover, for those who love, there are ample opportunities to camp. La Thames Coast Road, coastal 25, is a scenic road with wonderful views of the Firth of Thames. You go up to Tapu, before turning on Tapu Coroglen Road; over 30 km of dirt road that climbs the mountains, offering wonderful views. From Coroglen continue in the direction Waiau, accessible with the Road 309. This is another incredible and spectacular mountain dirt road. The goal is the waterfalls Waiau Falls, beautiful naturalistic show. There is a small parking lot along the 309, from which you leave the car after a short walk. A few minutes from here, the suggestive is waiting for you Waiau Kauri Grove; is a beautiful naturalistic itinerary where you can see some survivors of the Kauri, the really enchanting giant trees of this area. At this point, we recommend stopping at Coromandel Town for dinner and overnight. From this link you can take a look at the various facilities available in the city; many of these have excellent reviews, reflecting the goodness of the New Zealand accommodation offer !!! Whether you have opted for a Motel, an apartment, a cottage does not matter; the moment has arrived to leave towards the most extreme point of the peninsula, that is Port Jackson. To get there, it takes about 90 'of cars going first to the Colville Road, a coastal road with a unique carriageway, from which you can admire the splendid coastline and the surrounding nature; subsequently, continue on Port Jackson Road, charming dirt road that leads to the next destination, Port Jackson precisely. Fantastic beach and incredible views await you in these areas; continuing towards Fantail Bay, you will find the wonderful Port Jackson Capsite; it is a place of absolute peace and tranquility where you will sleep with the background of the waves and the rustle of the trees. During the day many excursions, walks and water activities are possible. Decide how much to stay: one or two nights; we are sure that you will appreciate the location. We organize wonderful barbecues. Wonderful sunsets. For all information you can consult the official website of the structure. Today's stage, absolutely unmissable because it leads to the most famous beaches in the area, requires less than two hours of driving. So be prepared to travel about 76 km, most of which on a dirt road to reach the small village of Whangapoua. We advise you to leave early in the morning, in order to take advantage of the whole day to visit one of the most beautiful beaches in the world !! Return with the car a Coromandel Town, then follow the directions for Te Rerenga, and finally take the coast Whangapoua Road to get to the homonymous village where it is located Whangapoua Beach; it is a long and marvelous expanse of very fine white sand that overlooks the calm waters of the Pacific. The beach, while being delicious, is only the starting point from which it will be possible to reach New Chums Beach. The notorious magazine "The Observer", in the 2006, has classified it as one of the 20 most beautiful beaches in the world! Despite the media resonance he received, New Chums however, it remains an uncrowded place, mainly due to the difficulties it presents to access it; two kilometers of sand and pebbles through the beach of Whangapoua Beach; then, you cross a wooded area among beautiful palm trees, until you arrive at your destination. We advise you to arrive at low tide and wearing athletic shoes (sometimes you will have to remove them because you will get wet); the flip-flops are absolutely not recommended! Chums, remains a wild, charming and still immaculate place. Unlike other facilities, you will not find picnic tables, showers or anything else; in all honesty, it will not be among the world's top 20s, nor least, the most beautiful beach in all of New Zealand, but we are sure you will not be disappointed. The small village of Hahei is the stage for your evening: from this link, you have the opportunity to take a look at the accommodations with the reviews of those who have already been there; also in this circumstance you can easily see the effectiveness and the goodness of the offers. To reach the small village, from Whangapoua, you have to take the S25 road; you will pass in succession Kuaotonu, Wharekaho, Whitianga, Kaimarama, Koroglen and finally Whenuakite. Well, we believe that by venturing on this journey, you will have a navigator, or a smartphone with a specially installed app. The program for the morning still provides a lot of sea and sun with a visit to Cathedral Cove e Hot Water Beach. They are, without a doubt, the two most famous and renowned tourist beaches in the area. Very particular, especially the second one, with its hot thermal springs that emerge from pools on the beach; the merit must be attributed to an incessant volcanic activity in the subsoil. The beach is located south of Mercury Bay; try to arrive two hours before or after the low tide, armed with a bucket and shovel, as it is customary to do on this beach. In fact, you will see many people digging holes in the sand that magically become hot springs. How to have a SPA absolutely free. Cathedral Cove (335 Lees Rd, Hahei 3591) instead, offers a naturalistic and landscape scenery to be left open-mouthed; it is perhaps one of the most beautiful and incredible beaches in all of New Zealand, with its "Cove" eroded by water and wind in the shape of a natural arch and golden sand. To get to the beach you have to take a path of almost 45 minutes from the GRANGE ROAD car park; here, you will find the directions of the path to follow. It's really worth it, a spectacular place. Forget, however, tranquility and discretion because it is the most crowded beach on the peninsula. Its appeal has increased dramatically following the release of the film "The Chronicles of Narnia II - Prince Caspian". In fact, a scene from the film was filmed right here! For lovers of beaches and the sea, along the road that leads to Cathedral Cove, let's report Gemstone Bay, Stingray Bay e Mares Leg Cove. 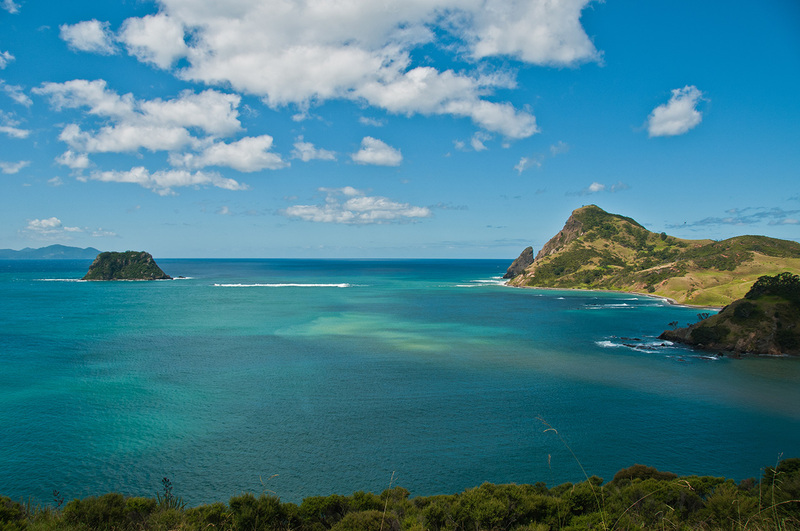 Beautiful and marvelous are the views and the landscape points along the whole Mercury Bay, another unmissable stop on the Coromandel Range tour. Those who are lovers of rough places, absolutely wild and unique, we recommend White Island. It is a very small and uninhabited island at 50 kilometers from the coast; is an appointment not to be missed, especially if you still have time available! It is a volcanic island where sulfur, fumes and crater outlets abound. The tour lasts about 6 hours and costs 199NZ $ per adult. All the practical information, timetables and online booking possibilities can be found on the official website. And here we are, therefore, at the end of our wonderful itinerary: 180 about km separate Hahei from Auckland. Even if you were directed along other itineraries, we are sure that by reading these lines, and looking at the images, a little 'curiosity about Coromandel Range we have insinuated in you.